In cooperation with the Swedish Transport Agency and Wallenius Wilhelmsen Logistics, MariTerm AB has developed a set of Excel spread sheets for designing and evaluating cargo securing arrangements onboard vessels. MariLash helps the user calculate the expected accelerations onboard the vessel based on vessel particulars, stowage position for the cargo and the expected sea state. Based on these accelerations, the required lashing forces for preventing shifting of the cargo can be determined for different cargo securing arrangements. By default, all calculations are performed in accordance with Annex 13 of IMO Code of Safe Practice for Cargo Stowage and Securing, but advanced users may adjust all parameters. 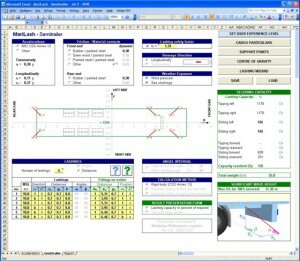 The results of the calculations are presented in a report suited for printing, either to PDF or paper copy. MariLash is delivered with module specific manuals. For further information on MariLash, please contact Sven Sökjer-Petersen telephone +46 42 33 31 04.